Best Emergency Fund Investment should be your first and foremost Investment to start your Investment Journey. It is very much needed due to the uncertain job market, serious illness or disability or accident can hamper your earnings. An adequate emergency fund can help you tide over the crisis. Financial experts say that you should invest 6 months of expenses for emergencies. Some people even say that 3 months of expenses are enough. Don’t ever go for 3 months idea. Statistics shows that in the US, the average duration of unemployment before 2008 recession was about 20 weeks (4.6 months). That average shot up to 40 weeks (9.2 months) in 2011. Their emergency fund has to be that much bigger. If you feel your job is very secure (Say Govt Job), you could have a contingency fund for outpatient treatments like Doctor visits, Therapies, Tests and Medicines by assuming that you have Health Insurance Coverage. Please Note that there is a life risk for every individual. Even though your job is very secure and you cannot predict life risk. It takes to settle the life insurance claim. So always be ready for emergencies. Keep aside the amount you or your family need in case of emergency. A final note on how much emergency fund investment you need, If it is a double-income house, then even three months of monthly costs is good. If it is a single-income house, then keep six month’s expenses is better. If it is a single-income house with ageing parents living with you, then keeping up to a year’s expenses is better. Please choose option according to your situation. After you figure out how big an emergency fund you need, you should invest in a fund which has low risk and easy accessibility. The problem with emergency funds is that the standard investments offer interest rate less than the inflation rate. Savings Bank accounts offer 4 – 6% interest rate on daily average balance. Short Term Debt Funds offer 8 to 9%. These returns are modest but it is better than no return. 1. Savings Bank Account: – Savings Bank Account offers 4% Interest rate. As on writing this post, Yes Bank & Kotak Mahindra Bank are offering 6%(With some condition on Daily Balance). Banks provide anytime anywhere withdrawal facility through bank ATMs and also you can transfer funds from anywhere through Internet Banking, Mobile Banking, SMS Banking Facilities. 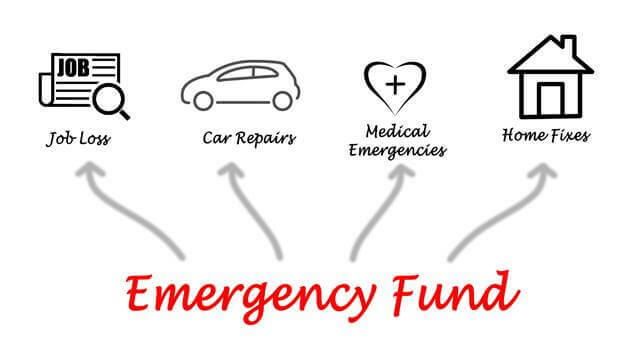 This is the best emergency fund investment option that provides easy accessibility to money in the emergency situation. You can pay hospital bills with your debit card, Withdraw cash anytime from ATM, Send money to anyone through Internet Banking. No Other Investment Option provide these many facilities in an emergency situation. You should invest at least 25% of your emergency fund in Bank Savings account. 2. Auto Sweep – In/ Sweep-Out Bank Account: – As you can see, savings bank account offer only 4% by most of the banks. To earn a much higher amount of interest with the same set of features offered by savings bank account, You can opt for Sweep-In/ Sweep-Out Account, where excess funds are automatically transferred into a fixed deposit and earn higher returns of 7-8%. Banks set the minimum balance to be kept in the savings account (10,000 to 25,000) which earn 4% interest. Any amount over this threshold limit will automatically convert into small fixed deposits in multiple of 1000 or 5000 depending on the bank. When you try to withdraw the amount from ATM or by Cheque, Your fixed deposits will automatically be liquidated when your amount goes below the threshold limit and provide the amount that you need in an emergency situation. Banks break Fixed deposits automatically in First-In-First-Out or Last-In-Last-Out manner. This is a very good emergency fund investment option to earn good amount of interest with high liquidity. 3. Bank Fixed and Recurring Deposit: – Bank Fixed Deposits offer high-interest-rate compare to savings bank account. In the case of Sweep Accounts, you need put a certain amount of money in the savings account for 4% Interest, whereas fixed deposits offer 7-8% interest on the full amount. Try to use Internet banking facility to make fixed deposits. So, that you can break the FD in the case of emergency and transfer the funds to your savings account to withdraw from ATM or transfer to anyone using IMPS Facility (To send money to other Bank accounts). When you break the FD, all you lose is half a percentage point of the return. You should invest in FD, which offer the highest rate of interest rate. Five Year fixed deposit (FD) will be the best emergency fund investment option. If an emergency situation may not arise at all, then you could earn a slightly higher return. 4. Liquid Mutual Funds – Liquid mutual funds invest in securities with a residual maturity of less than or equal to 91 days. Liquids offer 6-7% Interest. Generally, Liquid Funds will not have any exit load. So, you don’t lose anything on exit. These funds credit your account with the redemption amount within one business day. These funds carry Low risk and highly liquid in nature. So, you can park your Contingency funds for the needs which can be settled even after 1 or 2 days of delay in Liquid funds instead of Bank Savings account. Liquid funds can offer you higher returns than your typical savings account. Reliance Mutual Fund & two Robo-advisory platforms — FundsIndia and Scripbox offer debit cards. So the investor can withdraw the money directly without waiting for the redemption amount first going to his bank account. If there is no ATM Facility, money reaches bank account in 1 day. This option provides good liquidity as well as the good interest rate for your emergency investment portfolio. 5. Short-Term Debt Funds: – These funds offer slightly higher interest than liquid funds. They offer 8-9% Interest Rate. These funds invest in slightly longer term debt instruments with a maturity of more than 91 days and less than 1.5 years. Such funds typically invest in debt instruments such as Certificate of deposit, Corporate Deposits and Government Bonds. Ultra Short Term Funds may also levy an exit load for investors who redeem units within a specified period just like Bank FD’s. As I said in the case of Bank FD’s, If an emergency situation may not arise at all, then you could earn a slightly higher return. So, it is the best emergency fund investment option in India for better gains and with low risk. These are the Best Emergency Fund Investment Options in India. “Four Months Expenses + Life Insurance & Health Insurance Premium + Housing & Vehicle Loan EMIs” in Short-Term Debt Funds, Bank FDs and Liquid Mutual Funds. In any of these 3 funds, you can park this amount. “Two Months Expenses + Money for Doctor visits, Therapies, Tests and Medicines + Any Other Amount you need right at the Moment” in Savings Bank Account, Sweep Account & in Home Locker. Never put Emergency Funds in Equity-Based Mutual Funds, in Tax Saving Bank Deposits, in money back insurance plans, in corporate bonds, in stocks, in real estate. Choose products that are highly liquid and have low premature withdrawal penalties.